"Kansas City" redirects here. For the city in Missouri, see Kansas City, Missouri. For other uses, see Kansas City (disambiguation). 30th MSA (2,087,471), 24th CSA (2,428,362) in the U.S. 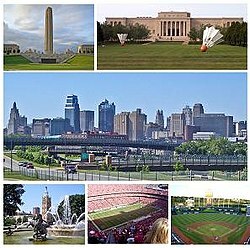 The Kansas City metropolitan area is a 14 county metropolitan area anchored by Kansas City, Missouri, and straddling the border between the U.S. states of Missouri and Kansas. With a population of 2,104,509, it ranks as the second largest metropolitan area centered in Missouri (after Greater St. Louis). Alongside Kansas City, the area includes a number of other cities and suburbs, the largest being Overland Park, Kansas; Kansas City, Kansas; Olathe, Kansas; and Independence, Missouri; each over 100,000 in population. The Mid-America Regional Council (MARC) serves as the Council of Governments and the Metropolitan Planning Organization for the area. The map's northeast quadrant is locally referred to as "north of the river" or "the Northland". It includes parts of Clay County, Missouri including North Kansas City, Missouri. North Kansas City is bounded by a bend in the Missouri River that defines a border between Wyandotte County, Kansas and Clay County, Missouri running approximately North-South and a border between North Kansas City, Missouri and Kansas City, Missouri running approximately East-West. The river band's sharpest part forms a peninsula containing the Kansas City Downtown Airport. Downtown almost always refers to downtown Kansas City, Missouri. Downtown is the Kansas City's historic center, located entirely within Kansas City, Missouri, and containing the city's original town site, business districts, and residential neighborhoods. 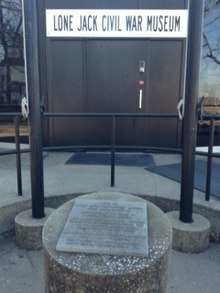 Downtown is bounded by the Missouri River on the north, the Missouri-Kansas state line on the west, 31st Street on the south and Woodland Avenue on the east. The downtown area includes the Central Business District and its buildings, which form the city's skyline. The Downtown Loop is formed by Interstates 670, 70 and 35. Within the downtown loop are many of the tall buildings and skyscrapers that make up the city's skyline. Also within the downtown loop are small, distinct neighborhoods such as Quality Hill, the Garment District, the Financial District, the Convention Center District, and the Power and Light District. Other neighborhoods within downtown are the River Market and Columbus Park, both located between the downtown loop and the Missouri River. Between the downtown loop and the state line are the Westside neighborhood and the West Bottoms, located at the bottom of the bluff adjacent to Kaw Point. East of the loop are the 18th & Vine District, the North Bottoms, and Northeast Kansas City (the East Bottoms, Northeast, and Pendleton Heights). South of the loop is the Crossroads District, Union Hill, Crown Center, Hospital Hill, Longfellow, Wendell Phillips, and Washington Wheatley. The Kansas City Convention Center, Municipal Auditorium, City Hall, Lyric Theater, Midland Theatre, Ilus Davis Park, and Barney Allis Plaza are within the Central Business District inside the downtown loop. The Sprint Center and the College Basketball Experience are within the Power & Light District, also within the downtown loop. The Kauffman Center for the Performing Arts is perched upon a high point immediately south of the downtown loop. South of the loop is the Crossroads District, Union Station, Crown Center, the National World War I Museum, Liberty Memorial, Penn Valley Park, Truman Medical Center, Children's Mercy Hospital, and the 18th & Vine District. North of the loop are City Market within the River Market and Richard L. Berkeley Riverfront Park. West of the loop within the West Bottoms are Kemper Arena and Hale Arena. Midtown is entirely within Kansas City, Missouri, just south of downtown, and bounded by 31st Street on the north, the state line on the west, West Gregory Boulevard (71st Street) on the south, and Troost Avenue on the east. Midtown is the core of the metropolitan area, as it contains numerous cultural attractions, shopping and entertainment areas, large hospitals, universities, and the metro area's most densely populated neighborhoods. Midtown consists of numerous distinct and historic neighborhoods such as Westport, Hyde Park, and Southmoreland. Shopping is centered on the Country Club Plaza, which contains numerous luxury retailers, hotels, and restaurants. Brookside and Westport also contain smaller-scale, neighborhood-oriented, and niche-market retailers. Midtown is home to Saint Luke's Hospital and Research Medical Center. Cultural attractions include the Nelson-Atkins Museum of Art, Kemper Museum of Contemporary Art, Uptown Theater, Starlight Theater, the Kansas City Zoo, Loose Park, and Swope Park. The last of these contains a soccer complex that is home to FC Kansas City of the National Women's Soccer League and the Swope Park Rangers, a United Soccer League team that is the official reserve side for the area's Major League Soccer club, Sporting Kansas City. Major educational institutions include the University of Missouri-Kansas City, Rockhurst University, Kansas City Art Institute, Stowers Institute for Medical Research, Midwest Research Institute, and Penn Valley Community College. Also known as "South Kansas City", this area consists of the southern half of Kansas City, Missouri, as well as the suburbs of Grandview, Harrisonville, Belton, Loch Lloyd, Peculiar and Raymore. The Northland is the area north of the Missouri River, bordered by the Kansas state line on the west and Missouri Highway 291 on the east. The southern half of Platte County, and much of Clay County make up the area. The economy of the Northland is dominated by Kansas City International Airport, Ford Kansas City Assembly Plant, the Zona Rosa shopping community and three riverboat casinos. The metro area's largest amusement park, Worlds of Fun and Oceans of Fun, is located in the Northland. Communities of the Northland outside the city limits include Parkville, Kearney, Liberty, Platte City, Gladstone, Riverside, Smithville, North Kansas City, and Weatherby Lake. East Side of the Metro is primarily eastern Jackson County which is an area of the Kansas City Metro that contains the far-eastern urban side of Kansas City, Missouri and the following large suburbs of Blue Springs, Independence, and Lee's Summit. Also included in this area is western Lafayette County Missouri and the far northeast portion of Cass County Missouri. The East Side of Metro includes the following Missouri suburbs of Independence, Blue Springs, Raytown, Lees Summit, Grain Valley, Oak Grove, Sugar Creek, River Bend, Lake Lotawana, Lone Jack, Greenwood, Unity Village, Buckner, Pleasant Hill, Bates City, Odessa, and Lake Tapawingo. Arrowhead Stadium, home of the NFL's Kansas City Chiefs and Kauffman Stadium, home of the MLB's Kansas City Royals are located on the eastern edge of Kansas City. The Silverstein Eye Centers Arena home of the ECHL's Kansas City Mavericks and the MASL's Missouri Comets is located in Independence. In Wyandotte County lies Kansas City, Kansas, which is locally called "KCK" to distinguish it from the larger Kansas City, Missouri (KCMO). It contains many residential neighborhoods, the Fairfax Industrial District, and the Village West entertainment district. The General Motors Fairfax Assembly Plant is located in the Fairfax Industrial District. Village West contains many area attractions. This includes many sporting venues such as Children's Mercy Park, home of the area MLS soccer team Sporting Kansas City, the Kansas Speedway, which hosts many NASCAR races, and T-Bones Stadium, home of the independent baseball team, the Kansas City T-Bones. Other Village West attractions include the Legends shopping district, the Providence Medical Center Amphitheater, and Schlitterbahn Waterpark. Johnson County, Kansas contains many suburbs, both small and large. These suburbs include Overland Park, Olathe, Shawnee, Leawood, Lenexa, Prairie Village, Gardner, Merriam, Mission, Roeland Park, Fairway, Lake Quivira, Mission Hills, Mission Woods, Westwood, and Westwood Hills. Many local area attractions and shopping districts are located in Johnson County, such as Oak Park Mall, Town Center Plaza, and Prairie Fire. 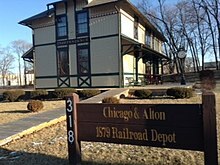 Chicago & Alton Railroad Depot Independence The oldest business building in Blue Springs, Missouri. In 1978, the hotel, which originally served the railroad, moved from the original site, just south of Main Street, to its present location. Dillingham-Lewis House Museum Blue Springs Built in 1906, the only native limestone structure in Blue Springs. The house is named after two families. Fort Osage National Historic Site Sibley, Missouri Part of the early 19th century U.S. factory trading post system for the Osage Nation. Jackson County Jail and Marshal's House Independence Former jail site, operated by the county historical society, which housed thousands of prisoners including Frank James and William Clark Quantrill. Leila's Hair Museum Independence A museum of hair art dating back to the 19th century. 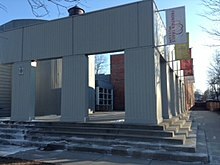 Midwest Genealogy Center Independence The largest freestanding public genealogy research library in the USA. National Frontier Trails Museum Independence A museum, interpretive center, and research library about the history of principle western U.S. trails. Silverstein Eye Centers Arena Independence A 5,800-seat multi-purpose arena that hosts the Kansas City Mavericks ice hockey team. The Truman Presidential Library, in Independence. The Truman home, in Independence, where Truman lived for most of his time in Missouri. The Truman Farm, in Grandview, built in 1894 by Truman's maternal grandmother. Grinter Place Kansas City, KS A home built in 1857 by one of the earliest settlers. The MSA covers a total area of 7,952 sq mi (20,600 km2) including 97 sq mi (250 km2) of water. The Kansas City-Overland Park-Kansas City, Missouri-Kansas Combined Statistical Area, which encompasses the Kansas City MO-KS MSA, the Warrensburg, Missouri Micropolitan Statistical Area (USA) (in Johnson County, Missouri), and the Atchison, Kansas µSA (in Atchison County, Kansas), covers a total area of 9,220 sq mi (23,900 km2) including 103 sq mi (270 km2) of water. I-435 – A bi-state loop through the city's suburbs in Missouri and Kansas. It is the second-longest single-numbered beltway in the U.S., and the fourth-longest in the world. I-635 – Connects the Kansas suburbs with Kansas City, Kansas, and I-29, I-70, and I-35. K-10 – A freeway linking I-435 to De Soto and Lawrence. K-32 – A highway that links Lawrence to Wyandotte County in Kansas. Route 7 - An important state highway serving the eastern suburbs of the metro. Primarily running north and south through Jackson and Cass Counties. Connecting the following communities: Independence, Blue Springs, Lake Lotawana, Pleasant Hill and Harrisonville. It is the commercial backbone for Blue Springs, Lake Lotawana and Pleasant Hill. Route 92 – This narrow and hilly road crosses the northern part of the metro, connecting Platte City, Smithville, Kearney, and Excelsior Springs. 18th Street Expressway – a freeway carrying US-69 through central Wyandotte County from I-35 to I-70. Shawnee Mission Parkway – Former alignment of K-10 from 1929 to 1983; K-58 from 1956 to 1979; US-56 from 1957 to 1968; K-12 from 1983 to 1998. Currently serves Shawnee Mission. Barry Road – Runs along the former route of Military Road, which ran from Liberty to Fort Leavenworth. It is now a major commercial street in the Northland, although it has been paralleled by MO-152 for its entire route and effectively replaced it east of Indiana Avenue. 87th Street Parkway – A major parkway that extends from Overland Park to De Soto. Former alignment of K-10 from 1929 to 1983. The Kansas City metropolitan area is served by several airports. It is primarily served by Kansas City International Airport, located 15 miles northwest of downtown Kansas City, Missouri, was built to serve as a world hub for the supersonic transport and Boeing 747. The airport's gates were positioned 100 feet (30 m) from the street; however, since the September 11, 2001 attacks, these have undergone expensive overhauls, retrofitting it to incorporate elements of conventional security systems. There are two general aviation airports in Johnson County, Kansas. New Century AirCenter borders southwest Olathe and northeast Gardner. The primary runway at New Century AirCenter is the second longest runway in the region next to those at Kansas City International Airport. It is located 7 miles from the Logistics Park Kansas City Intermodal Facility. The other airport, Johnson County Executive Airport has one runway on 500 acres and is the fourth busiest towered airport in the state of Kansas. The Kansas City Downtown Streetcar is a 2.2-mile modern streetcar line in downtown Kansas City opened to the public in May 2016, and is maintained and operated by the Kansas City Streetcar Authority, a non-profit corporation made up of private sector stakeholders and city appointees. A ballot initiative to fund construction of the $102 million line was approved by voters on December 12, 2012. The system will run between River Market and Union Station, mostly on Main Street, with extensions to the starter line planned for addition at a later date. The Downtown Loop is a complex layout of freeways in downtown Kansas City, Missouri involving 23 exits, four Interstate highways, four U.S. highways and numerous city streets. Each exit in the freeway loop is numbered "2" and suffixed with every letter of the alphabet – except I, O and Z (which would resemble 1, 0 and 2 on the exit signs), although some of the exits are currently under construction/renovation and closed to traffic. The entire circumference of the loop is just over 4-mile (6.4 km). The Veterans Affairs Medical Center, located near the intersection of I-70, Linwood Boulevard and Van Brunt Boulevard, has a large "VA" emblem. 135th Street (Overland Park, Kansas) - Shopping area featuring several indoor and outlet malls, restaurants, and two movie theaters. Strawberry Hill is a historical area in Kansas City, Kansas that was home to many eastern European immigrants. Later, the neighborhood became home to many Latino/Chicano families. However, in recent years, Strawberry Hill has seen residents immigrating to the area from Eastern Europe. The Kansas City Kansan serves Wyandotte County, having moved from print to an online format in 2009. Additional weekly papers in the metropolitan area include the Liberty Tribune, Sun Newspapers of Johnson County, The Examiner in Independence and eastern Jackson County, The Pitch, and the Kansas-Missouri Sentinel. The area is also served by two newspapers focused the area's faith-based population: The Metro Voice Christian Newspaper and the Jewish Chronicle. The city's Hispanic and Latino American community is served by Dos Mundos, a bilingual newspaper with articles printed in Spanish and English, and Mi Raza magazine, the area's only weekly Hispanic publication printed in Spanish. The Kansas City Call serves the African American community publishing its paper weekly. Other major employers and business enterprises are AT&T, BNSF Railway, GEICO, Asurion, Sprint Corporation, Citigroup, EMBARQ, Farmers Insurance Group, Garmin, Hallmark Cards, Harley-Davidson, Husqvarna, H&R Block, General Motors, Honeywell, Ford Motor Company, MillerCoors, State Street Corporation, The Kansas City Star, and Waddell & Reed, some of which are headquartered in the metropolitan area. Kansas City also has a large pharmaceutical industry, with companies such as Bayer and Aventis having a large presence. Triumph Structures Kansas City, An Aerospace manufacturing leader. ^ "County Population Estimates-U.S. Census Bureau". Census.gov. Archived from the original on August 31, 2004. Retrieved October 12, 2011. ^ "Bulletin" (PDF). Archived (PDF) from the original on 2008-12-15. Retrieved 2013-07-10. ^ "publicpurpose.com". publicpurpose.com. January 10, 2002. Archived from the original on September 27, 2011. Retrieved October 12, 2011. ^ "Maps and Schedules". KCATA. Archived from the original on April 20, 2010. Retrieved March 16, 2010. ^ "Light Rail and MAX". KCATA. Archived from the original on January 15, 2010. Retrieved March 16, 2010. ^ "Kansas City voters approve streetcar plan". Kansas City Business Journal. Archived from the original on July 30, 2013. Retrieved January 26, 2013. ^ "Kansas City streetcar rides will be free". Kansas City Business Journal. Archived from the original on November 12, 2012. Retrieved January 26, 2013. ^ "Official web site of the". Country Club Plaza. Archived from the original on October 11, 2011. Retrieved October 12, 2011. ^ "Metropolitan Community College, Kansas City". Mcckc.edu. Archived from the original on October 11, 2011. Retrieved October 12, 2011. ^ "Vatterott College - Kansas City, MO". Archived from the original on April 13, 2015. Retrieved April 6, 2015. ^ "Newsroom: Cerner.com". cerner.com. Archived from the original on 16 September 2014. Retrieved 27 April 2018. This page was last edited on 23 April 2019, at 01:24 (UTC).